BRMB Blog - Beat the dog days of winter and have so mush fun dogsledding! Beat the dog days of winter and have so mush fun dogsledding! In many parts of Canada, we are lucky enough to get to experience all four seasons at their most extreme. We get the blooming springs, hot summer sun, the flourishing fall colours, and of course cold snowy winters. With each season comes new opportunity to try new backcountry adventures, and there is no time better than winter to jump out of your comfort zone and into some new fun. This winter, we suggest you add to your true Canadian skill set and have a go at dogsledding. What could be better than bounding through the snow with a couple of friendly fuzzy faces, immersed in beautiful Canadian backcountry? The best way to experience dogsledding, especially for the first time, is with a guided tour. Because dog sledding is such a key component to Canadian winter, you can find tons of places to book a tour for your first time ride all across the country. Here are our favourite 8 places to try dogsledding in Canada! Known as a haven for all things winter, Whistler BC is home to great opportunities to try out dog sledding as well! 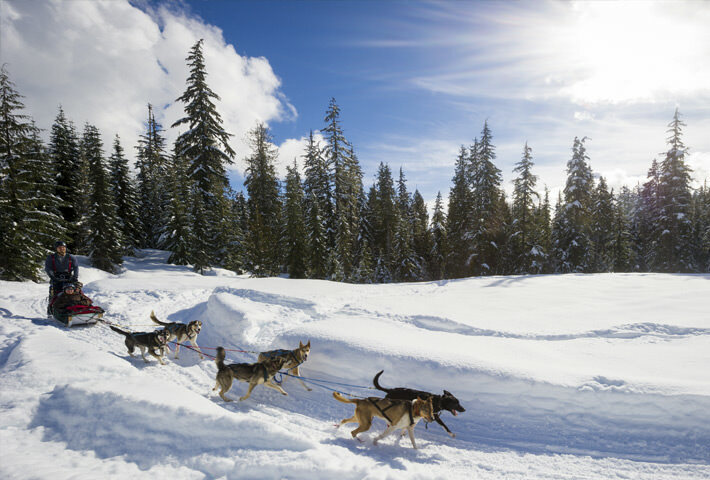 Feel the wind in your hair as you mush through Whistler’s Canadian Winter Wonderland with a team of powerful sled dogs. You have the option to sit back and enjoy the ride or step into the mushers shoes to learn something new. You will not only get to experience the thrill of dog sledding, but you will also learn how to harness and stage the dogs for riding, as well as learn commands to handle the sled along the journey. Visit their website to book your quintessentially Canadian dogsledding experience in Whistler BC. Just west of the bustling winter town of Golden, BC, Golden Dog Sled Adventures offer interactive dog tours through the beautiful, rugged backcountry of the Kootenay Rockies. With a variety of tours, featuring hands on experiences while riding, the whole family can enjoy a trip with their beautiful Siberian and Alaskan Huskies at an affordable cost. Along the way you will be surrounded by towering mountains, sprawling meadows and TONS of wildlife like elk, snowshoe hare, mink and possibly even big horned sheep or lynx. The Golden Dog Sled Adventures website has all the information on the trips they offer, as well as the option to book online, so do not wait to plan your paw-fict dogsledding adventure! You will have a howl of a time cruising through the Canadian Rockies with Howling Dog Sled Tours. Partake in this traditional Canadian winter sport and enjoy your ride through the beautiful Spray Lakes Provincial Park. All tours offer the option to help your musher harness the dogs, hook them up and even drive, or you can sit back and allow the guide to do the work – whatever your preference! With inclusive transportation to and from all major hotels in Banff and Canmore, as well as complimentary snacks and a hot beverage, Howling Dog Sled Tours makes it easy for you to make the most of your dogsledding experience! Visit their website for full details on package options, as well as what you should wear before you head out with your hounds! Experience one of the oldest winter traditions in Canada while exploring the largest forest region in Canada. With Sundogs dogsledding tours in Saskatchewan, you will have the chance to tread trails through Prince Albert National Park, Great Blue Heron Provincial Park and Anglin Lake tugged along by powerful sled dogs. The variety of excursion options, as well as affordable price points, makes it easy for the whole family to head out for an afternoon, full day, or multi-day trip and learn about the ancient activity of dogsledding. The Sundogs website offers tons of information on the specific trips they offer, as well as great photos to get you even more excited for your once in a lifetime ride. Located in Northern Manitoba, Churchill is known worldwide as a prime destination for all things winter. Whether it is a trip to see the polar bears or the northern lights, Churchill attracts tens of thousands of eco-tourists each year. One exciting opportunity you have to try on your trek up to Churchill is dogsledding with Blue Sky Expeditions. Guided by internationally renowned musher Gerald Azure, you will get to see the beauty of Manitoba’s rugged winter backcountry from the comfort of a sled. You do not have to make your trip in the dead of winter, however, to experience the mush - their introduction to dog sledding is offered year round, though the warmer months often see clients being pulled by carts with wheels instead of sleds. No matter the season, a Bluesky dogsledding expedition is one you will never forget! Featuring over 30,000 hectares (80,000 ac) of beautiful Canadian backcountry forest, dotted with over 50 lakes and hundreds of ponds, the Haliburton Forest in Cottage Country Ontario is an incredible place to explore. And, with over 300 km (186 mi) of groomed trails to explore, the Haliburton forest is a haven for dogsledding. The Haliburton Forest & Wildlife Reserve offers the best opportunities to experience Haliburton by dogsled with introductory, half day and full day tours. En route you will have lots of time for photo opportunities and the 150 dogs at the Haliburton Forest & Wildlife Reserve are always ready (and eager) to get you on your first dogsled ride! Situated in the Acadian New Brunswick village of Allardville, Snow Dog Adventures offer over 60 km (37 mi) of groomed trails to guide you along an incredible dogsledding journey! Featuring over 10 different tour options, there is sure to be one to fit the exact trip you desire. Once on the trail, you will get to see the beautiful valleys and gorges that Allardville has to offer. Spend the night after your ride in a cozy bed and carry on the winter adventure the next day, cross-country skiing, snowshoeing, snowmobiling or just appreciating the beautiful New Brunswick backcountry. Whatever the adventure, no trip to Allardville is complete without one of their iconic dog sledding tours! Your day will be packed full of adventure on an exciting dogsled with Snowpak Kennels. Located in Riverdale, Nova Scotia a trip with Snowpak Kennels begins by meeting the sled team, and, depending on your level of comfort, you can watch the guide prepare the dogs for the ride or even help harnessing them yourself. After that you will go on a 5 km (3 mi) trip featuring many twists, turns, valleys and hills, and even flat stretches where the dogs will test their speed. When you are finished, you can warm up by the fire and enjoy a hot beverage discussing the exciting trip you had. Snowpak Kennels is only open Friday, Saturday and Sunday dependant on weather conditions, and you must call ahead to book your adventure. For more winter fun check out our variety of Backroad GPS Maps, covering the whole of Canada from coast to coast including the Yukon, Northwest Territories and Nunavut! In the maps you will find enough winter adventures to keep you busy for many winters to come, along with plenty of POIs and new places to explore all year round. Do not put a pause on fun this winter - have so mush fun dogsledding! Did we miss your favourite place to dog sledding? Let us know in the comments below or share your best photos with us on Instagram using #brmblife for a chance to be featured on our feed and win prizes.